If you've had a full enough life, I suppose there's nothing scary or depressing in getting older. Such is the case in No! 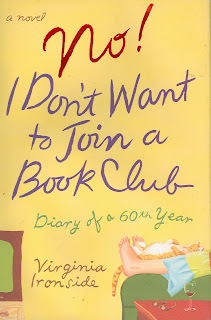 I Don't Want to Join a Book Club by Virginia Ironside. This book is written from the perspective of a 60-something Bridget Jones. Marie, the narrator of the book, is turning 60 and has decided to keep a journal. She is very happy about the upcoming milestone. She feels that at 60 she has earned the right to a quiet, calm life. She will no longer feel guilty about not learning Italian, or refusing to join a book club, or doing any of those other activities that are expected of "active seniors." Throughout the book, she makes reference to her wild younger days -- frequent drug use and "sleeping with a Beatle" are two of the events she mentions. In an effort to show how "hip" she still is, the narrator often includes the texts of the latest spam emails she's received. This, along with very detailed descriptions of her interactions with her baby grandson, detract from what might have otherwise been an engaging book. She does live in Shepherds' Bush, but she describes it as a very depressed area that's "full of hoodies." I did learn an interesting fact from reading the book. Marie, while staying at a friend's country home, deals with the instability of somewhat unreliable plumbing. She relates the story that the designer Laura Ashley was staying in a country house and got up in the middle of the night to use the loo. Unfamiliar with the layout of the house, but unwilling to turn on a light and possibly disturb her hosts, she fell down the stairs and eventually died from complications from the fall. What an epitaph -- died looking for a toilet! I can totally relate! On another literary topic, a researcher has authenticated a portrait of William Shakespeare, the only one known to have been painted during his lifetime. Bill Bryson, in his excellent book Shakespeare: The World as Stage points out that the images we have of Shakespeare all appeared years after his death. This recent discovery may provide the best evidence yet for how Shakespeare actually looked.